Making your own Jasmine Oil is a really simple but rewarding thing to do. This video takes you through the steps of making this restorative and sweet smelling skin care oil. 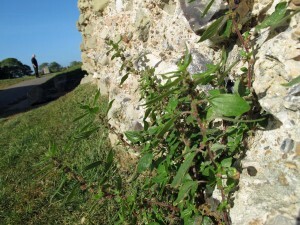 I found this on a walk in Pevensey Castle growing on the walls. Pellitory is rich in Sulphur, Calcium, Potassium, and other trace minerals. It has a soothing diuretic action on the urinary system but the clever bit is it is also a stone solvent. A few years ago I had a patient come to me with her kidney X-rays and pointed out a stone she had in her Kidney. She did not want to have an operation immediately, but wanted to try Herbal Medicine to dissolve the stone. I saw her over a period of six months, over which time I gave her a mixture of herbs in tincture form, two of which were Pellitory and Stone Root (Collinsonia Canadensis). I was expecting her to complain bitterly as passing gravel from dissolving stones is apparently very painful and can cause damage to the tubes of the urinary system when it is passing through. She never complained about pain on passing urine but said she steadily felt better with an improved urine flow over the months she was taking the herbal tincture. At the end of the six months she had another Kidney X-ray, which showed the stone had completely dissolved and been passed out of the system. We were both very happy people!! Rheumatism is a very similar condition to arthritis but affects muscles as well as joints. Sadly by the time Rheumatism sufferers come to see me they have usually had the condition for many years resulting in degeneration (breakdown) of the joint lining and stiffening of the muscles. They have a long history of taking strong anti inflammatories, pain killers and possibly steroids. I know the joints and muscles are painful and inflamed but pain tells us when to stop doing something and if it is masked then there is a possibility the joint is used beyond its capability causing further damage to the joint itself. So my first advice is to always be aware of the limitations of a rheumatic joint and only use it as much as is comfortable. Many people report that it is worsened by damp weather so keeping warm and dry in cold damp weather is important. The Romans found England too cold for them and imported nettles to grow. They then used to flail their joints with the nettles!! This increased the circulation to the joint warming them up. I DO NOT RECOMMEND DOING THIS. I tried it once and it is very painful and then you are left with the sting for ages. We have the Romans to thank for nettles and garden snails!! Diet is very important but different people find their condition may react to different foods. The norm is to radically reduce the intake of dairy and wheat and never eat any Tomatoes and Oranges. The acid in these two foods is not broken down by the body so creates an acidic environment which is not good for joints and the urinary system. Many rheumatism sufferers find eating meat will increase inflammation. The message here is to keep an eye on your diet to see if any foods do make your rheumatism worse. If they do, you may have to visit a nutritionist to cut out these food substances while maintaining a healthy diet. Dandelion root tincture, which improves digestive function and elimination of toxins via the Bowel. Celery seed, (small amounts) to improve uric acid excretion from the kidneys as well as having anti rheumatic properties. Meadowsweet, a little favourite of mine, which has strongly anti inflammatory properties. Crampbark, to relax muscles which may have tightened up due to the Rheumatism and which will put pressure on the joints, exacerbating the condition. This is not set in stone and may vary depending on the patient, what medicines they are already on and the severity of their condition. There are many over the counter herbal remedies for rheumatism but if you buy one make sure it is a licensed product, which means it is tried and tested. I do recommend if you have suffered from Rheumatism for some time and are on orthodox medicines but want to try an alternative, that you visit a qualified Medical Herbalist who can take all these factors into account and will tailor make an Herbal Remedy specifically for you. Three years ago just before we were about to walk 80 miles from Greenwich to Eastbourne along the Wealdway, our first ever long distance walk, I got shingles! At first I thought I had several bites on my left side which were raised and very itchy. I then started to get pain in the area and stomach pain. Shingles is caused by the same virus that causes chicken pox and the virus sits on the nerve ending, causing chicken pox like spots in the distribution area of the nerve. Typically this follows the line of a rib or can be down the leg or in the head. It is very itchy and very painful. I immediately started to take both Marigold and St. John’s Wort tinctures to get on top of the virus and made myself copious amounts of fresh lemon juice to increase my Vitamin C intake. Fortunately I had made some St John’s Wort oil from flowers I had picked on the shingle beach (see the video). St. John’s Wort oil, rubbed into the shingles, relieves the pain and attacks the virus externally. Although the Shingles had not cleared up completely, I was able to do the walk which took us seven days, staying at bed and breakfasts along the way. It is important to boost the immune system so that the body can defend itself and fight against the virus. Shingles are said to be stress related and I was helping out at a care home at the time where one of the residents had shingles. Porridge/ muesli/ any wholegrain cereal/ fruit/juice. Not all at once! Cooked meal with some protein foods such as meat eggs or fish /pulses beans for the vegetarians or just if you like them. Fresh veg although fresh frozen will do if you are busy. Some carbohydrate such as rice potato or pasta. Always vary it though and make sure you do not eat too much of any one thing. For example don’t eat toast for breakfast, a sandwich for lunch and pasta for dinner. That’s three lots of wheat a day and the gut will not like digesting all that! Loads of Vitamin C containing foods, which is all fruit and veg but especially citrus fruits and zinc containing foods which is oats, peas, pumpkin seeds, lentils and Oysters if you are feeling rich. Drink water and not too much tea and coffee. Have a look at the article on stress to learn more, but briefly, make relaxation and switching off time for yourself. Dance, sing, read, watch a film, join a meditation or yoga class, anything that helps you to relax. Exercise I can almost hear you groaning but this is really not an option. It gets the body in good shape to be able to cope with external and internal changes. Alcohol and cigarettes also affect the immune system, so if you can reduce, it will help. Echinacea is the herb of choice to boost the immune system which it does by raising the white blood cell count and increases the body’s own powers of resistance. It also has the ability to stimulate Killer cells called Phagocytes, that chomp up any foreign material in the body especially bacteria. About three weeks of taking Echinacea is enough time to boost the immune system and then let the body take over, but in a case of active shingles it is worth taking Echinacea while the shingles persist. There are many over the counter preparations of Echinacea but make sure it is a good quality preparation with a licence, meaning it has been through a rigorous testing programme. Never forget Garlic. I know some people won’t touch it because of the smell but eat as much garlic as you can in your food. It is the most astounding food for all kinds of conditions in the body one of them being to boost the immune system as well as having antiviral properties. Garlic is excreted through the lungs and skin pores so sterilises everything on the way out. One of my daughter’s friends had a baby recently and apart from the usual “congratulations it’s a girl” card I gave her a lump of pure Cocoa Butter. When I had a shop in Slough, the West Indian Ladies used to come and tell me great tales of folk medicine in the West Indies and the Bush teas their mothers and grandmothers made. They also told me about Cocoa Butter which they said was the best thing for clearing up any scarring of the skin and keeping the skin supple. Since then I have told every pregnant person to rub Cocoa butter on their tummies and to use it after the birth of the baby to help the wrinkly tummy skin return to normal. Cocoa Butter in its natural form is a creamy coloured solid at room temperature. When you rub it on your skin, the warmth of the body melts it and you can spread it all around quite easily. I stock it in my clinic or you may be able to buy it on the internet. That’s all that needs saying on that subject. Nice and easy. I will not see someone with a persistent cough unless it has been first investigated by the orthodox profession, because of the implications a persistent cough might have. However if it has been diagnosed as having no known cause then it is well worth treating a persistent cough with herbal medicine as there are several herbs that have an excellent cleansing action on the lungs and respiratory system. The respiratory system is very vulnerable to external irritants and the first course of action is to protect it from the external environment. Marshmallow is the herb that does this. We saw the marshmallow on the Cuckmere river walk growing in profusion on the river bank and in the treatment of IBS. It is high in mucilage which coats and protects mucous membranes. The marshmallow leaf is used for the protection of the lungs. The lungs are just an open space and it is difficult to cleanse a space, but any herb that contains a volatile oil (evaporates on warming) will clean the lungs. Garlic must come top of the list for this, as it is anti bacterial, antiviral, stimulates the immune system has an anti histamine type action is antispasmodic and an expectorant (helps to cough up gunk). Wow! There you have all you could ever want in one plant to treat most lung infections and irritations. An allergic cough needs to be treated by a professional as the herb of choice for this is Ephedra, a restricted practitioner only herb. Eyebright and horsetail tone all mucous membrane linings and Horsetail, which I will be showing you in one of my future walks is high in Silica which helps with tissue healing and strengthening in all mucous membranes. It is always worth reducing dairy intake if you have a persistent cough as dairy is Catarrh forming which may cause aggravation in the whole respiratory system. Whilst we are on the subject of diet (you notice I tried to slip it in quietly), to heal any body tissue you must have a good intake of Vitamin C and Zinc. Vitamin C from any fruit or Veg and Zinc from pumpkin seeds, peas and oats. Persistent coughs usually respond well to herbal medicine so it is worth visiting a qualified medical herbalist to help get it treated. For my clinic details, please click here or on the tab at the top of page. In ancient times on bloody battlefields common moss was used as a wound dressing to staunch the flow of blood and help sterilise the wound. The common moss we see in shady slightly damp places is now little used in herbal medicine, although I have read the spores of the plant were used as a diuretic and to ease stomach aches as well as an application to wounds. However Irish moss, Carageenan, is still extensively used, especially in the food industry. As a medicine it has nutritive and restorative properties and is soothing for the lungs and bladder. If you look at the ingredients of foods, many times it will be Carageenan, an extract of Irish moss that is used as the thickener.